Robert Davidson was born in 1750 in Elkton, Maryland. As a young man, he attended the University of Pennsylvania, graduating in 1771. A year later, at the age of twenty-two, Davidson was licensed to preach by the Presbytery of New Castle and was soon sent to preach at the Second Presbyterian Church of Philadelphia. He became a professor of history at the University of Pennsylvania in 1773, during which time he worked as an assistant to the pastor Dr. John Ewing of the First Presbyterian Church of Philadelphia. The University awarded him a doctor of divinity degree in 1784. Shortly thereafter, he left the city to take up residence in Carlisle as the Vice Principal (under Principal Charles Nisbet) and Professor of History and Belles Lettres at the fledgling Dickinson College. In 1785 he became pastor of the Presbyterian Church of Carlisle, a position that he held until his death twenty-eight years later. 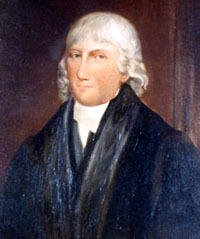 In 1796, Davidson was elected as moderator of the General Assembly of the Presbyterian Church. Following Nisbet's death in 1804, Davidson was elected Acting Principal. He held this position until his resignation in 1809. He is considered the second president of Dickinson College, although he never officially held that title. While a student, Davidson married, and he and his wife Abigail shared a long marriage before her death in 1806. In 1807, Robert Davidson married his second wife, Margaret Montgomery of Carlisle, who was thirty-one years his junior. Unfortunately, Margaret died in March 1809 after giving birth to their second son. Davidson resigned from his position at Dickinson College in that same year in order to devote himself completely to the church. On April 17, 1810 he married once again, this time to Jane Harris. He continued with his duties as the pastor of the Presbyterian Church of Carlisle until his death on December 13, 1812.